From 2008 - 2010 or so, Unwelcome Guests were on a tear putting out 7"s. Between their singles, splits and compilation appearances they unloaded a ton of songs and I was only too eager to buy every one of them. Then in 2010, they released their first full length, Don't Go Swimming. I didn't find it as exciting as the singles were. 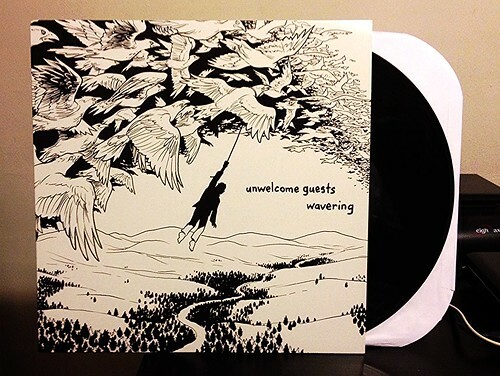 It wasn't bad, in fact it was quite good in places, but the band felt a bit more polished and were lacking some of the energy of the 7"s.
Unwelcome Guests are back in 2014 with their second LP Wavering. I can assure you any questions I had about their energy level have all been thrown out the window because this album just rips from start to finish. They manage to combine a rootsy sort of appeal with the hooks and passion of bands like Rumspringer or Your Pest Band. Then add on a huge helping of lead guitar gymnastics that you'd really only find in bands like Dinosaur Jr. or, if you need a more modern comparison, Tenement. Every one of the songs on this album are as great as anything the band has previously released. This is Unwelcome Guests at the top of their game. I cannot say enough great things about Wavering. It's the kind of record that you keep going back to over and over again; each time finding something new to love about it.